Check these items off of your ICO launch list. The website is the hub of your crypto ICO marketing efforts. 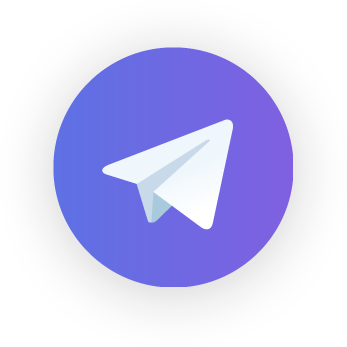 It both engages newcomers and serves as the central resource to your Telegram community. However, the core function of your ICO website is to convince investors of your project’s value. Like a digital handshake, your site should be accessible, appealing, and professional. This is key because the perceived credibility of your project is derived from the initial perceptions of your website. According to ConversionXL, people form their impression of a website in just 50 milliseconds. 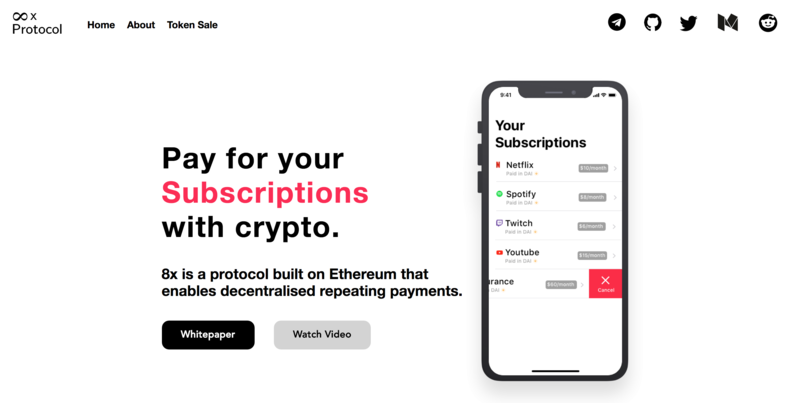 The headline announces the purpose of your crypto project. What is your big idea? The largest text on the page should announce your value proposition in a succinct and compelling way. Visitors want to know about your project concept, so addressing the end-benefit to the user is always effective. As you write the headline, consider whether your audience is developers, speculators, or investors. For example, the 8x Protocol site uses a rotating flash image to communicate its function in paying for subscription services, rent, and insurance. The headline is effective because it instantly conveys the coin’s function. Investors with an eye for consumer services and e-commerce will know this is the coin for them. Use the explanation section to give a snapshot of your crypto project. This is where you detail to investors the key aspects of your project. What do you plan to build? How will this benefit your audience? Summarize how your technology fits the market, provide the unique selling points, and outline why you’re worth the investment. 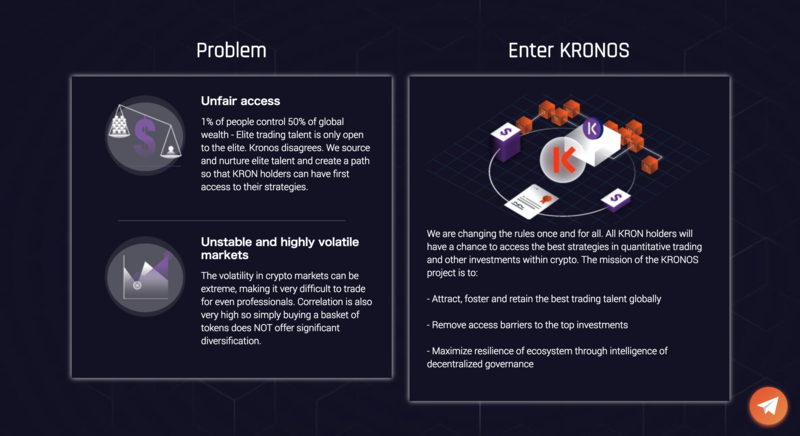 Below, Kronos explains its coin with bullet-lists and graphics. This explanation is effective because it highlights the technology as a solution to two existing problems. It also succeeds by mentioning the user benefits in layman’s terms. You want to omit technical details from the explanation section as much as possible. Data overload will reduce comprehension and diminish the user experience of your site. Visuals: Visuals are a quick and effective way to communicate your ideas. Diagrams and illustrations will compliment your marketing messages and help explain your crypto project, especially to the impatient. Since people are quick to recognize and discredit stock imagery, whether photos or graphics, all visuals should be original. Explainer Video: If a picture is worth a thousand words, an explainer video is worth millions. Video excels at eliciting an emotional response from viewers and detailing complex ideas. Aim to inform, inspire, and generate trust. At the end of the day, some people would just prefer to watch a video. The white paper is foundational to your marketing and should be readily available. Link to your white paper in the navigation bar, then again further down the page. Since this document is critical to persuading investors, use a bold call to action (CTA) button to encourage downloads. Ideally, you’ll use active and benefit-driven verbs – Download, Get, Access – to entice the conversion. Seen below, the page for Moondock’s white paper offers a clean interface and easy navigation window. Readability is key to ensuring the details of your technology and business model make an impact. Some people will land and want to read later, so offer a downloadable PDF of the white paper as well as an HTML version. This section allows you to grow and connect with your audience. From here, people should be able to contact you or engage on your social networks. Here we see Origin Protocol prompting users to join its Telegram from the first page. The central placement of the CTA makes it obvious that Telegram is the way to connect. You should also feature a persistent widget on the bottom right of your screen. If you’re funneling people to Telegram, make it easy to join from anywhere. Email Capture: Use a call to action (CTA) to grow your email list. Ideally, the email capture should be visible on every page. You can also include this in the page footer. Reddit: Hosting a plethora of crypto subreddits, the platform recently announced that it will reintroduce crypto payments for its premium service, Reddit Gold. Telegram: As of May 2018, Telegram was host to 200 million active users. This is the default platform for building a crypto community. Discord: Some 15 million active users use Discord for regular discussions about all things crypto. Medium: The so-called blogger’s network is a regular publisher of crypto news, commentary, and thought leadership. The roadmap shows how you arrived at where you are today. Highlighting the journey helps to establish the legitimacy of your project and your team. Include important dates and key inflection points, such as milestones, hires, or recognitions. This basic roadmap from Origin Protocol helps users visualize the past – and believe in the success to come. For startups, the roadmap shows investors that you have a plan and can accomplish your goals. For growing companies, it forecasts future success and generates trust with investors. Putting a face to your project will enhance its validity. Add names and photos for your team members, then a blurb that describes their role, competencies, and experience. Below, Oyster Protocol highlights its key players. Angel investors and VCs are especially keen to legitimate your project by its team, including advisors. This due diligence is inevitable, so assist this by providing everyone’s LinkedIn for these interested parties. Ideally, each person on your team is multi-professional and holds some experience with the blockchain. This is where you detail the specifics of your token. Give the name, price, token allocation, buyback, fees, platform, etc. The information provided must allow potential investors to calculate the market cap, the circulating and total supply of tokens, and the path to purchase. Be transparent about every transactional detail for both the pre-sale and the crowdsale. You can invite participation by showing the amount of funds raised, the current number of investors, and the accepted cryptocurrencies. As the ICO approaches, a custom graphic or counter is often used to give the current status. GDPR compliance is important, both to users and your team. Any compromise of data could find you liable, so affirm that any exchange of coin for tokens will be compliant. Use your crypto website to engage and assure investors that their money is in safe hands. Be comprehensive in communicating your value in the marketplace. Affirm your reliability with social networks, roadmaps, and team member biographies. Take a detailed approach to creating a rewarding website experience for would-be investors, one that promises returns and supports its claims.